For the best players in the world golf is not easy which is odd since the concept is so simple—start here and hit a ball into a hole over there. But as even casual golfers know that’s really hard to do. So accepting the difficulty of the pastime we call golf (they were going to call it something else but all the other four-letter words were being used), recognize we only add to the frustration by playing courses set up so we have no chance of success. That doesn’t mean everyone but pros and scratch handicaps should play putt-putt layouts but suppose we define golfing success as having an enjoyable time with friends and a reasonable opportunity to make a few pars during a round? How about an occasional birdie on the card? You get my point. The game is a lot less fun and certainly we feel a lot less successful if, on a par-4, after hitting our best drive and a pretty darn good second shot we still must hit a mid-iron (or more) to reach the green. Sound familiar? It’s the idea behind the PGA’s program “Tee It Forward” which encourages golfers to play from a tee set ahead of where they usually play. Less distance, a chance to reach most if not all of the par-4s in two and maybe even have something less than a wood for the third shot on the par-5s. It’s more fun too. Certainly a win-win for golfers and golf because if it’s more fun people will play more often and bring their friends. But what if you’re already playing the most forward set of tees and still can’t reach any of the par-4s in less than three or four shots? Or that you must hit driver on every par-3 (and are still short of the green)? And forget about the par-5s which are more like par-7s or par-9s. Players in this category have slower swing speeds and are effectively playing courses approaching 8,000-yards based on the relative distance they can hit the ball. PGA Tour professionals don’t even play courses that long so we are asking these shorter hitting usually less skilled players to sacrifice fun, enjoyment and the thrill of making a birdie for someone else’s idea of golf. By and large these players are women, who along with juniors are the segments of the population where golf can find new players…its chance for growth. This notion shorter hitting women should tee it up on a course that for them is a 1,000-yards longer than the guys on Tour play is not a great way to keep anyone playing golf much less make it attractive to take it up. Then there’s the issue of holes with long forced carries or cross hazards in front of greens or bunkers placed so there’s no way to run a ball on to the green and one of my favorites—putting surfaces management has decided should emulate the contours and speeds of Augusta National during the Masters. Boy, talk about a formula to back up play and drive all but the most fervent out of the game…you couldn’t plan it any better, even if you tried. Put another way, our game has intellectual and emotional rewards that attract and keep people playing. It is also endlessly frustrating and a test of character like almost no other. So if we want to push people out—particularly ladies with the capability to hit their drives maybe 150-yards—making courses long and difficult is a sure to accomplish the goal. Plus playing from tees that are too long is a primary cause of slow play so the proper course set up goes a long way to solving the “I don’t have the time, it takes too long” reason why people don’t play or play less. Put everyone on a set of tees commensurate with how far they hit the ball and play is much faster. 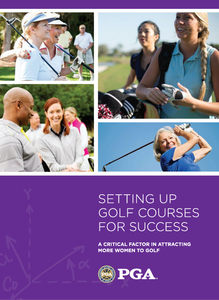 It’s filled with interesting solutions targeted at making courses more enjoyable for women. There’s some obvious concepts (though the vast majority of courses still don’t get it) such as a set of tees so women can hit short and middle irons into par-4s just like men rather than a fairway wood. Or how about setting up the course figuring out the correct set up to leave approach shots over cross hazards that can be hit with a lofted club so there’s some chance it will stay on the green rather than run over as it probably would if a fairway wood had to be used. My favorite section though is “Tee Nomenclature” which tackles the traditional black, blue, white and red tee names, holdovers from a bygone era when gender and age somehow were the determinants of where you could play. How about dropping these preconceptions and naming tee sets after local landmarks, people or even just different colors than the “sacred” four. We need to change the negative connotation some men seem to have from playing “the ladies tees” or the inane testosterone-dripping “taking it back to the tips” or whatever else gets in the way of everyone playing the set of tees most suited for their skill level. Presuming of course there are a set of tees meeting criterion. 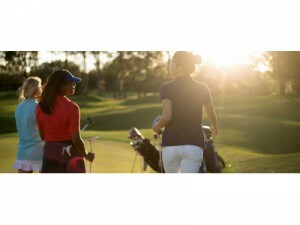 Which brings us back to “Setting Up Golf Courses for Success” and the basic idea if women can’t hit the ball over 150-yards there should be tees they can play to get the satisfaction and enjoyment inherent in the game.